You are currently browsing the SparksElectric.com blog archives for July, 2011. One of the best ways to stay healthy is to stay physically fit, eat healthy, and keep your mind active. Work does help in keeping you busy and productive. Competition helps keep your mind sharp. As an electrical contractor working as an electrician, the work can be very physically challenging at times, it helps to maintain a high level of physical health and fitness, this serves both me and my customers. This is one reason why I am never planning on retiring, at least not before the age of 120. This is also why I can offer a lifetime warranty on my work. Here is some inspiration for US all. TMJ4 has a nice video here with film of the damage caused by the storm. 21,000 WE Energy customers lost their electric power due to tree limbs falling on power lines. We would suggest every homeowner have at least a small portable back-up generator to keep the sump pumps operating during and after a storm just in case you lose your power. Most customers will get their power restored within a day or so, some could wait for 5 days before their power is restored. If you are considering a generators, call your favorite electrical contractor. If you have lost power or know of someone who lost power, call you favorite electrical contractor and ask if they have an electrician that can repair any damage done to your wiring. 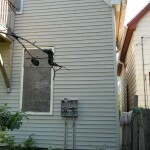 Sparks Electric provides emergency repairs for such damage.